Looking for the best golf clubs beginners can pick up and play with ease? They aren’t hard to find, but choosing the perfect set to suit your needs is an entirely different story. If you’re ready to start your new obsession, keep reading as our experts have just the thing for you. Designed for seniors looking for a set of forgiving lightweight clubs. A high-end set built for beginners that want the best. Affordable and efficient clubs that won’t break the bank. Graphite shafts and perimeter weighting are just two highlights of this set. For beginners looking for basic budget-friendly clubs. My grandfather picked up my first set of Dunlop clubs as a Christmas present when I was a teen. While I don’t get to play regularly these days, I have dented plenty of drivers over the years and spent a considerable amount of time at the 19th hole. Golf has often been called the Game of Kings although you don’t need to be royalty to enjoy the sport. When just starting out, the best golf clubs beginners should consider need to meet a few strict requirements while pros have no shortage of options. If you’re at the beginning of your journey, you've definitely come to the right place. Our experts reviewed the top golf sets for rookies and put together a guide which covers everything from what “lie” means to accessories you should never leave home without. Consumers looking to hit the links for the first time have a lot to consider beforehand. While your choice of attire or golf ball is worthy of its own list, we set our sights on golf club sets built for beginners. While there are literally thousands of options on the market, our options had to meet specific criteria to make the cut. Start by simply going for sets which are suitable for your handedness. 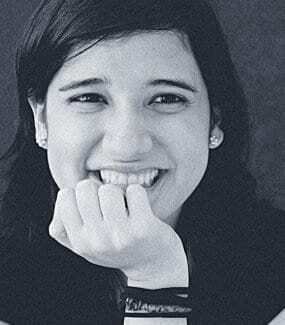 Choices are limited for lefties, so that alone may narrow the field considerably. After you come to grips with the grip, you’ll want to look at the driver. Check the size of the head (bigger is usually better) along with the shaft. You may not use it often, but the driver is a very important club. Irons can have a steel or graphite shaft and will get more use than your driver or fairway woods, so durability is essential along with the materials used in the head. You’ll also want to check the quality of the bag along with the putter style. Blade putters are the most common, but mallet putters may be more suitable for beginners. By the way, do you have golf pants that are ready for the action? There is a huge gap between good and great when it comes to golf equipment. The quality of the clubs can give you a huge advantage on the course or hinder your progress if they are substandard. With that in mind, here are the areas you’ll need to key in on if you’re new to the sport and don’t currently own a set of clubs. Golf is an expensive sport, but you don’t have to be a doctor or lawyer to afford a decent set of clubs. You do need to think of how much you want to spend initially however along with how often you think you’ll actually play. In other words, if you’re unsure how you’ll take to golf, don’t spend an arm and a leg on a set of clubs. On the other hand, if you’ve gone to driving ranges or play the occasional round with borrowed clubs, it may be time for a proper set. We’re not talking about a set of Maruman Majesty clubs either, but something geared towards beginners – not clubs that require a bank loan. With that in mind, our team has something for everyone whether you’re spending a grand or a few hundred bucks. Just keep in mind, the phrase “you get what you pay for” rings true in the golf world more than with other products. A set of Cobras will outlast clubs from Dunlop or Wilson, and the chances of your clubhead flying across the course decrease as well. 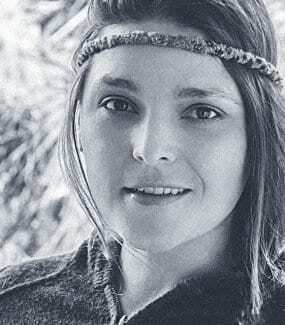 It all depends on the set you’ve got your eyes on and can vary quite wildly. One manufacturer may think a “set” involves around eight clubs and a bag while others give you the full 12 clubs… or more. Unfortunately, the phrasing used by most manufacturers is inaccurate so you’ll need to proceed with caution and take those titles with a grain of salt. Whenever a manufacturer says they have an 18-piece golf club set, they mean it literally. The bag counts as a piece, and so do those head covers. While straps and other accessories are excluded from this marketing gimmick, you’ll want to count the clubs before getting too excited. 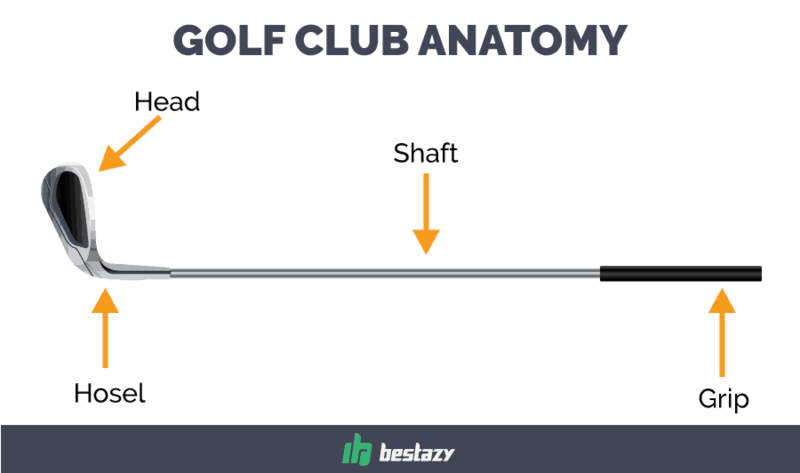 How many clubs you actually need varies as well although there are a few simple guidelines to follow and “standard” clubs found in every set. You’ll always get a driver along with a few fairway woods and several irons. Wedges are hit or miss in cheaper sets, but something we recommend as you’re bound to find the sand sooner than later if you’re just starting out. The official USGA limit is 14 clubs per bag, but the average is usually 12 clubs although you can get by with 11 or even 10 in some cases. Golf terms can be confusing, but the gear is easy to wrap your head around. Your main piece of equipment lives up to its name considering a golf club is actually shaped like a club. That doesn’t mean you don’t need to have a grasp on what different parts of the club do. Grip – This is where you’ll put your hands to grip the club, and it’s usually made of rubber or an exotic composite with a catchy name. There are different sizes and types of grips including oversized variants, but it’s not an area to spend too much time on. That’s because you replace them if you don’t like the feel or just prefer a different brand of grip. 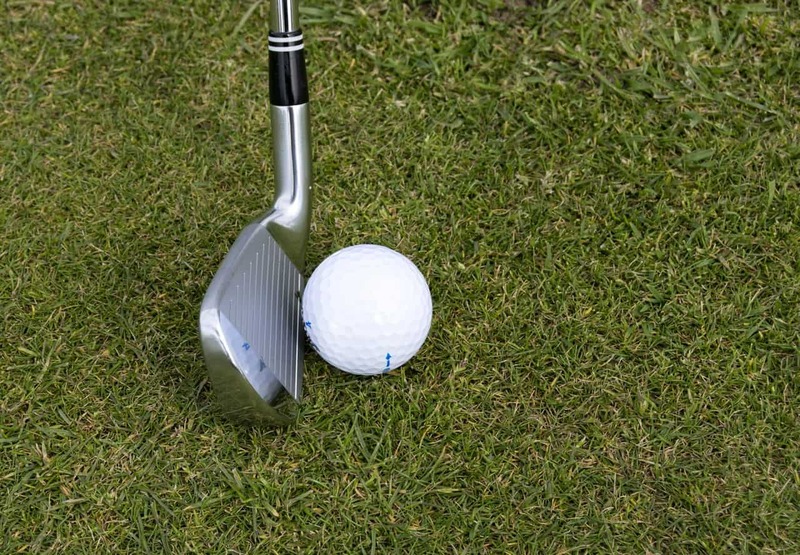 Shaft – After the grip is the shaft which runs the length of the club down the hosel and head. What you’ll want to focus on here are the materials used which are usually steel or graphite. Your swing or clubhead speed determines the type of shaft you may need as well, and there are several levels to choose from.If a shaft is designated as an R, it’s regular and ideal for golfers with an average swing speed of between 70 to 80 mph. You can find both graphite and steel shafts in this class with X, or extra stiff shafts are built for high-speed swingers over 90 mph.In the middle, you have Stiff clubs marked with an S, and on the low end, there are clubs labeled A and L. The former are for senior golfers and the latter or for ladies. Both typically use graphite shafts to increase swing speed while stiff clubs can be graphite or steel shafted. Hosel – No for something less complicated – the hosel. Otherwise known as a neck, the hosel attaches the shaft to the club. It can be straight or angled depending on the design which can directly affect the lie angle of the club and the loft.There are also adjustable hosels for drivers that professionals can install on some clubs, and others have that feature built-in. You can change the loft of a driver in seconds on clubs like the Ping G30, a fairway wood with five different settings. You won’t find adjustable hosels on any of the clubs in our sets but should have them high on your list when it’s time to add to your bag. Club Head – The head is the largest part of the club and where the magic happens. On drivers, the trend is the bigger, the better as those oversized heads have larger sweet spots which means you’ve got more room for error. Titanium is the most common option with drivers on the high end as it has an excellent strength to weight ratio.Stainless steel is also a popular option across the board along with carbon steel in irons and wedges. The USGA has rules in place to regulate how fast a ball can come off the club, so there are limits to the size and materials used. The head is important, but so is the face which is the part that makes contact with the ball – when you hit properly. Those are just the most critical parts of the golf club, and the things most commonly mentioned by manufactures. If you want to learn more about the face and physics behind a good golf swing, be sure to give this a quick read. Now that you understand the most important parts of the clubs in your bag, it’s time to talk about what they’re used for and what to expect. We’ve also included a yardage estimate for “average” golfers although those results will vary depending on just how green you are. If you’ve played a few rounds, feel free to skip ahead as you already know the differences between a fairway wood and an iron. Woods– Drivers are in the wood family and live up to their name as they “drive” the ball down the fairway towards the cup. It’s also arguably the most important club in your bag considering it’s the first one you’ll use. If you shank your first shot into the rough, it’s going to have an impact on the rest of the hole.Pros can get around 280 to 300 yards from a driver on a regular basis. Rookies are lucky to get 150 without some practice, but the average is around 180 – 200 for most adults.There are drivers built for the fairways as well. Fairway woods are basically baby drivers and provide you with distance off the fairway or the tee on occasion. They have a similar construction to drivers, but with smaller heads. We aren’t going to put a range on these as there are too many variables like hybrid clubs and irons. Hybrids – Is it a wood or is it an iron? That may be the first question to spring to mind when you set eyes on a hybrid club. These clubs are designed to bridge the gap between fairway woods and lower irons, and it usually replaces a few clubs in your bag.Clubs of this nature often have a head similar to a fairway driver but designed to give your shots more loft. It’s a personal preference although one that’s becoming more common as they perform as advertised and lighten up your bag a bit. Irons – Once the ball leaves the tee, it’s generally time to break out the irons on shorter holes. These clubs cover the distance from the fairway to the cup and vary depending on the set. If a hybrid is included along with several fairway drivers, you may only get the 6-iron through the 9-iron in your bag.As for the range, an average male can drive the ball around 160 yards with a 5-iron while a 9-iron is good for 120-130 yards in ideal conditions. You can typically expect roughly 10-15 yards difference between the irons depending on your skill level, the clubs, and mother nature.If you prefer a full range of clubs, you’ll want to look for a set that includes irons 3 through 9. If the manufacturer mentions cavity back irons, they are far more forgiving than blade-style irons. You can learn more about the iron styles here as they are similar to the next clubs in your bag. Wedges – Unless you’re rocking a high-end set, you’ll probably just have one wedge in your bag – two if you’re lucky. The first one would be the pitching wedge, which can also fall into the “iron” class as well. It’s the club you’ll want when there’s around 100 yards between the ball and the green. 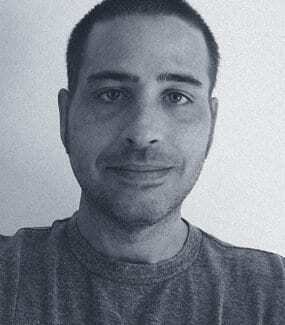 A sand wedge will get you out of those pesky traps in a stroke… or three depending on your level of skill.The average range on a sand wedge is probably around 70 yards for beginners, but a pro may squeeze 100 out with no problem. A lob wedge is ideal for shorter distances while a gap wedge is sandwiched between the pitching and sand wedges. Putter – While you may start each hole with a driver, you’ll finish it with a putter in most cases unless you sink an Ace or Eagle. Like every other club in your bag, there are many tricks manufacturers can use to set their putter apart from the rest and two main styles with mallet and blade putters.Blade putters have been around for decades, and are what you’ve used on a putt-putt course – everyone will be familiar with these. Mallet putters are larger, and becoming more popular by the day but aren’t ideal if you have an arc stroke. Despite the name, swing weight has nothing to do with how much your club weighs, so there’s no need to head for a scale. It’s actually how a club feels when you swing it, something you’ll notice quickly when taking practice swings with a Cobra before jumping to a Wilson. It’s also a measurement as fulcrums are used, and there is an official scale. We’re not going to get too technical as there are different trains of thought on swing weight. Some manufacturers stagger the weight throughout the set from the driver to the putter while others believe the set should retain the same swing weight so they’ll feel the same. This is going to be another area that comes down to personal preference, something tough to figure out when if you’ve never taken a swing. 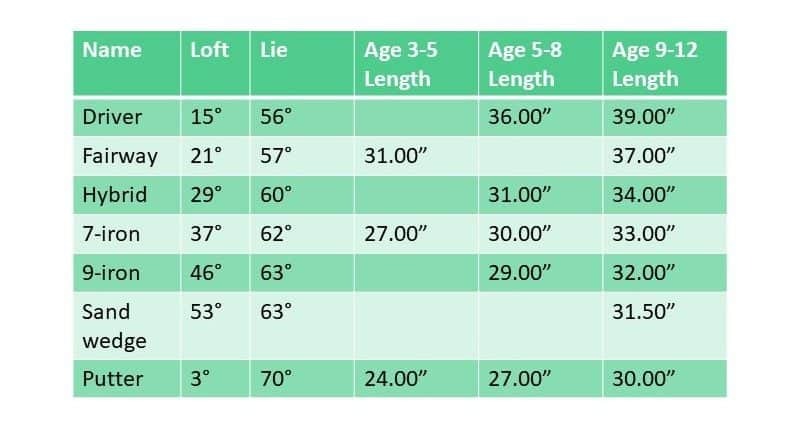 Sizing can be tricky for beginners, even if manufacturers provide you with precise measurements. You’ll need to understand what those terms mean and have a rough idea of what size clubs you’ll need as well. 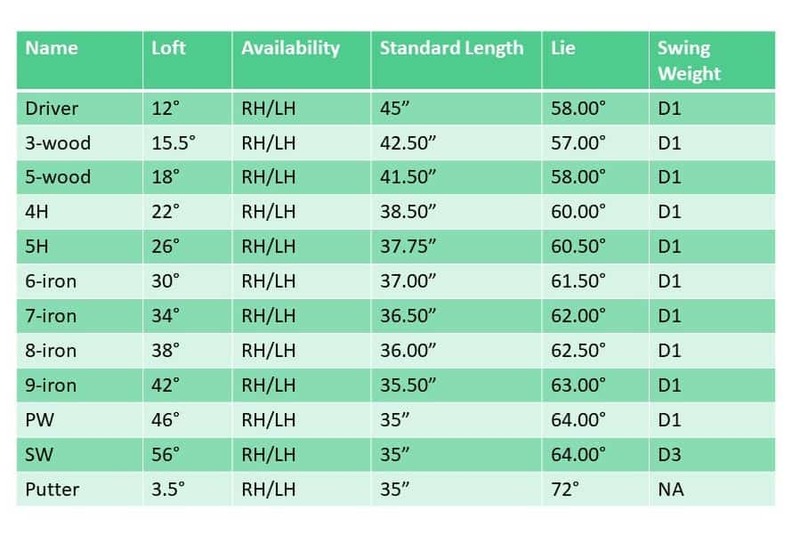 We can help you with terminology, and many companies have their own sizing charts which give you the scoop based on your height. We’re not going to talk about bogeys, Eagles or the proper technique for an explosion shot out of a trap. Instead, we’re going to discuss things like for loft and forgiveness. Forgiving – While not a term used on the course, the best golf clubs for beginners are usually ones deemed “forgiving” by the manufacturer and it’s a term you’ll frequently encounter in our guide or when looking for new clubs. Simply put, this means the club is constructed to forgive you when you take a bad swing or strike the ball off center. Those are things you’ll do more often than not when you’re hitting the links for the first time. 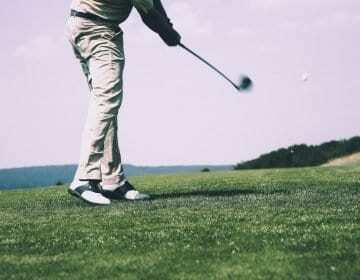 Fore – Arguably the most important term you’ll need to know, fore is what you’ll yell whenever you think a ball you’ve struck may strike someone else. It’s a warning, and if you hear it, you’ll want to be wary as a golf ball can cause significant damage. While you may not necessarily need to jump under a cart, don’t take the word lightly. 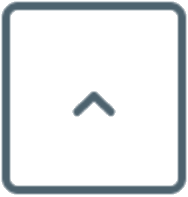 Par – On a golf course, this is the number of strokes you have to get the ball from the tee box to the cup or hole. It’s always par 3, 4 or 5 unless you’re playing something wild like the Sano Course in Japan which has an insane 964-yard par 7 hole. Bogey & Birdie – When you’re one stroke over par, it’s called a Bogey. One under par is called a Birdie. Loft – Whenever the word loft is related to a golf club, it means the angle on the club face. This dictates the trajectory and varies depending on the club. Drivers typically have a lower loft while wedges are set higher. More loft equals more height, something you’ll want on approach shots when control is crucial. 19th Hole – Yes, a golf course only has 18-holes, but you will often hear people talk about the 19th. This magical place is actually the clubhouse or bar, where golfers go after they’ve sunk the last putt of the day. Those are just a few terms you’re likely to encounter your first time out. If you want to learn what a flange is or a topped shot, be sure to give this a good read. While all our sets will get you started, they will only get you so far unless you want to pony up at the pro shop. Before you can head to the driving range or dream about playing 18 holes, you’ll need to have a few essential accessories in your bag. 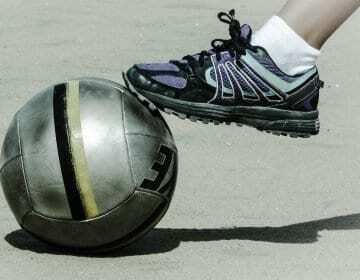 Shoes – Certain sports require specialty footwear and golf just happens to be one of them. Golf shoes are cleated and give you extra grip when you transfer your weight during a swing. 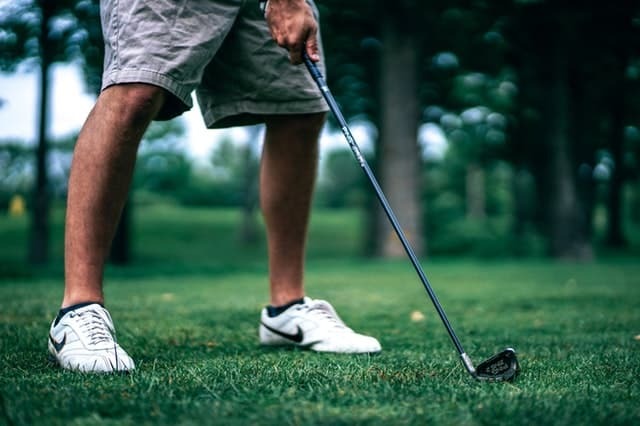 While they aren’t necessarily required (many courses allow other shoes), they are something to consider seriously.You can buy golf shoes with fixed cleats or ones with that you can remove or change out on a whim. The latter requires a bit more maintenance, but either style will work, and some look like ordinary sneakers. Gloves – Baseball players use gloves for a reason, and so do golfers. Perfecting the right golf grip is easier said than done, and it’s critical when you want control at the point of impact. A good golf glove gives you additional grip which can keep the club from turning in your hand.Personally, I use the Dura Feel from Nike, but Callaway, TaylorMade, and all the top brands make golf gloves as well. It’s another item you don’t have to use, but one we highly recommend. Tees – The golf tee is the simplest piece of gear in your back and something you’ll need before playing a round. Your ball is placed on the tee in a tee box or teeing ground at the beginning of each hole. 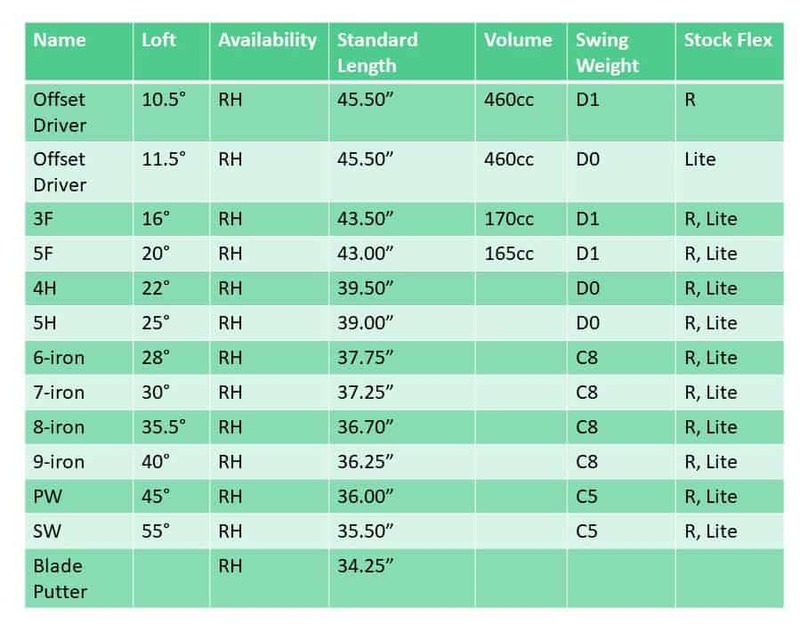 While height certainly matters, there are different types of tees on the market today.Wood is the most popular option, and any bag will do whether they are from Pride Professional or something off the rack at the Pro shop. Plastic tees are popular as well, and there are even specialty tees that claim to add yardage to your drives as well. Balls – There far too many golf balls to begin to list and each manufacturer claims theirs is better than the rest. Cheaper balls are covered with Surlyn while the more expensive ones have an urethane covering.Golf balls covered with Surlyn fly at a higher trajectory than their urethane counterparts but won’t have nearly as much spin. On the other hand, urethane balls are easier to damage and cost more to replace. There are advantages and disadvantages to each style although many golfers count the Titleist V1x among the best. We’ve included sparse sets for beginners along with advanced ones from top-tier brands. What you won’t find are any golf club sets that lack the essentials, so all our options come complete with a bag, putter, driver and several irons at a minimum. Callaway gained many fans in their Big Bertha days, and the brand has expanded considerably since then. While you can still score a Great Big Bertha driver, the Strata Ultimate set provides you with every club you’ll need before hitting the links. 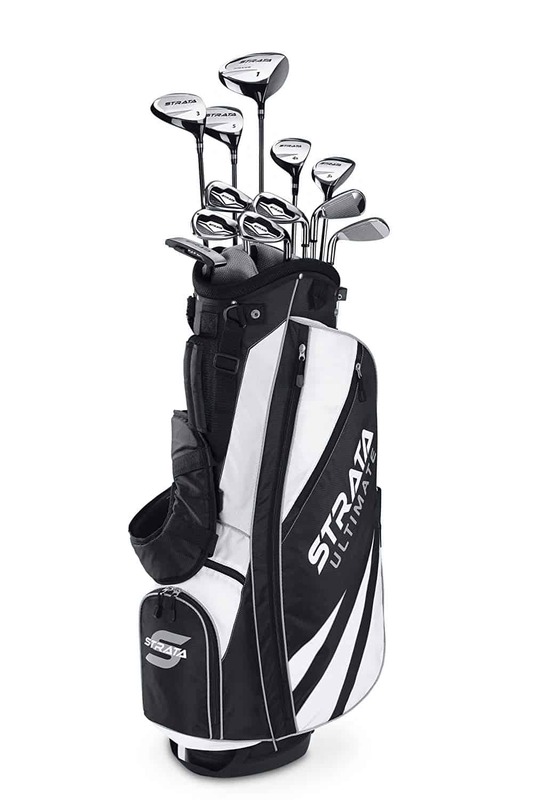 The Strata lineup comes in several different flavors, but we went with the 12 club set. The extra clubs add quite a bit of value and are ones you’re more likely to use than not. 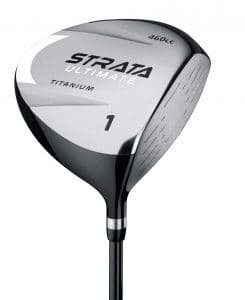 First, we’re going to start with the driver which is made from titanium with a massive sweet spot. It’s 45-inches long with a 12-degree loft and a lie of 58-degrees. It’s a D1 club as are the rest of the clubs aside from the sand wedge which is a D3. In addition to the regular driver, you’ll receive two fairway drivers with a 3-wood and 5-wood along with a couple of hybrid clubs. The 4H is 38.5-inches while the 5H is a hair shorter. Both have a similar lie, and all four of these clubs have a higher loft. You can check out the tech specs for the drivers and irons in the chart below. The hybrids clubs replace the traditional long iron in this bag, so if you want a 5-iron, you’ll need to pick one up separately. While you probably won’t need it, we recommend the Rogue X if you prefer to keep your clubs within the Callaway family. Outside of the main clubs, you’ll also receive a pitching wedge, sand wedge, and a putter. The wedges have the same length and lie, but the pitching wedge is a 46-degree loft while the sand wedge clocks in at 56-degrees. The wedges and irons are stainless feature “high flight” tech which is quite forgiving, and the putter has a milled face for increased accuracy when it’s time to send the ball to its home. It’s the same length as the wedges, but with a 3.5-degree loft and 72-degree lie. No golf set is complete without a bag, one requirement all our choices had to meet to make our list. 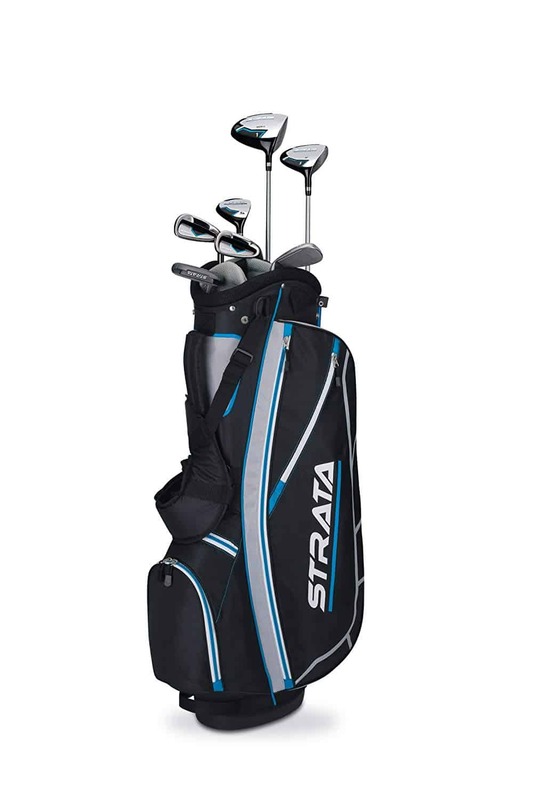 The Callaway Strata Ultimate set comes with a sturdy bag that sports a built-in stand and enough pockets to hold all your gear – even a pair of shoes. You’ll still need to pick up balls and tees, but there are five covers to protect your drivers and a padded back strap. These clubs are available for both left and right-handed golfers and have a very reasonable price tag considering the brand and the fact you’re getting 12 clubs. They are covered by a 2-year warranty against defects in workmanship but not against fits of rage so don’t take it out on the clubs if you shank one into the tall grass. 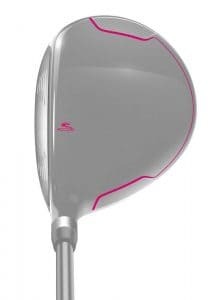 Cobra makes excellent clubs, and while we’re going to take a look at a top-tier set for men, these are built especially for women. The Cobra XL’s are also a little easier on the bank account, but still give you the same quality you’d expect from the company. 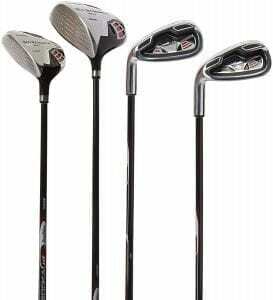 This is another 12 club set with a full range of drivers to go along with several irons. The irons range six through nine with flexible graphite shafts. The 6-iron has a loft of 26-degrees and a lie of 62-degrees while the 9-iron has a lie of 62-degrees and a loft of 40. The other irons fall between that range as you can see by the chart and the lengths decrease in ½-inch increments. Those irons have low-profile heads that are undercut. This gives you more launch off the fairway, and the chrome finish ensures your clubs still hold up long after others have shown their age. The wedges are top-notch as well, and the putter is nothing to scoff at. All have oversized Lamkin Rel 360 grips that are comfortable and give you an extra measure of control. Cobra went all out with the woods in this set, so you’ll get a driver along with three fairway drivers and a hybrid long iron. The 5H takes the place of the low irons missing from the bag and is in the C7 swing weight class along with the fairway woods. They have a low back-weighted center of gravity which gives a boost to the ball and takes your drives to the max. The driver is just as forgiving as the rest of the clubs with a large sweet spot and eye-catching design. It has a 15-degree loft and 58.5-degree lie and is also a C7 club like its shorter siblings. At 44.5-inches, it’s a good length and will provide plenty of distance off the tee. The hybrid is just as lightweight as the rest of the set as well. The Cobra XL bag is built for the cart or your shoulder with plenty of dividers and six storage pockets. There are also two dedicated pockets for beverages and waterproof pouch. It’s a good looking bag that’s just the right size, and unlike other models, you’ll actually get a few colors to choose from this time around. While it’s hard to argue with how stylish the Silver and Raspberry combo is, not everyone likes pink. If you fall into that category, there is a Silver and Mint, and Black and Capri Blue sets to choose from as well. 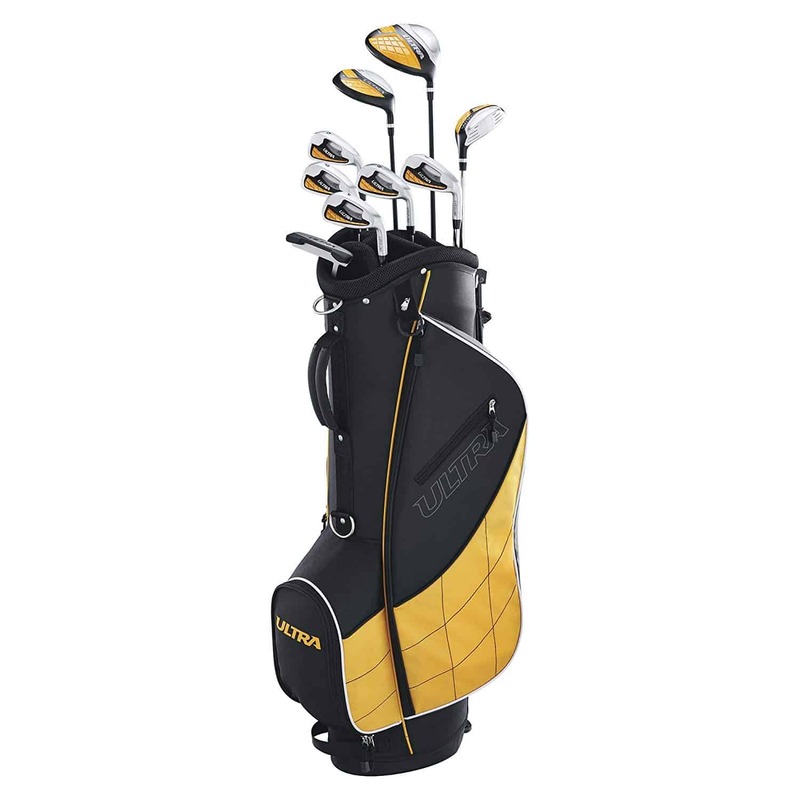 Regardless of which shade you prefer, all the clubs match the bag and covers to a T. On the downside; this is another right-handed set – sorry lefties. TaylorMade is another brand in the same league with Cobra and Callaway or above them depending on where your fandom lies. Our top choice for younger golfers is the Phenom Youth Golf Set, which is nice enough to make adults a little green with envy. The Phenom golf set comes in two variants with your choice of a 5 or 7-club set. The bag counts as the extra “piece” in the marketing material, but it’s actually worthy of counting as one this time around due to the quality. If your little pro is of average height for his age, you’ll want to start with the K40 Phenom set. 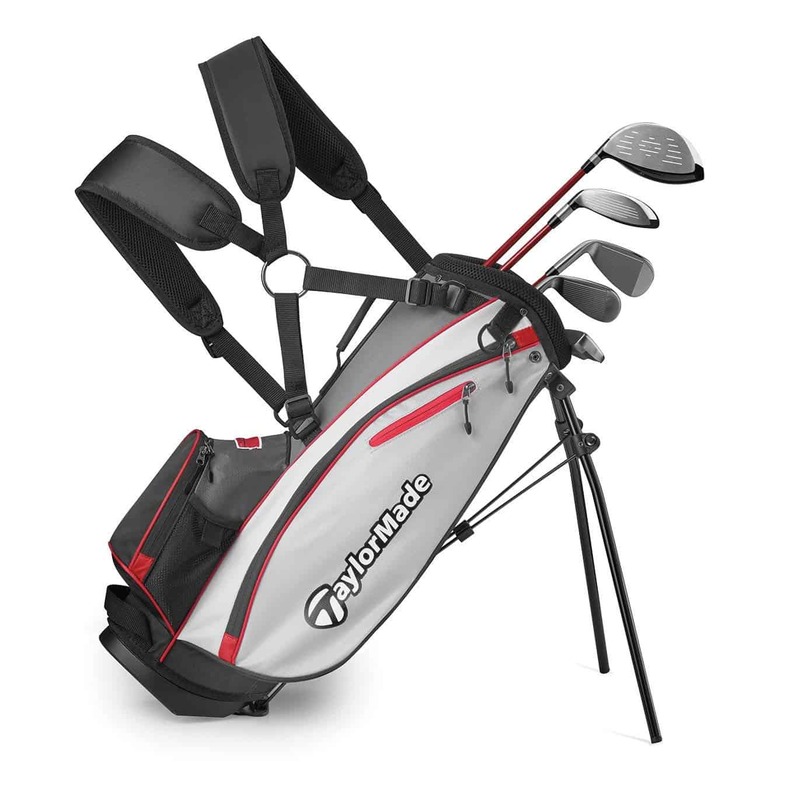 TaylorMade rates the K40 for children ages 5 to 8-years of age. The clubs are all staggered in length with the driver measuring 33.5-inches and the putter at 25-inches. Between those clubs, you’ll find a sand wedge, 7-iron and what’s referred to as a rescue club. Wait… What’s a Rescue Club? Whenever you hear this term, which probably won’t be very often, it refers to a hybrid. TaylorMade coined this phrase over a decade ago with their first hybrid club, and now other manufacturers call them hybrids or utility clubs. The K40 has a 29.5-inch hybrid wood which is around 5-inch shorter than the rescue club in our next set. The K50 is rated for children 9-12 years of age and comes with a few extra clubs in the form of a 9-iron and a fairway driver. All the other clubs stay the same and appear to have the same features aside from length and potentially loft. The overall range of this set goes from 29-inches to 39.5-inches from putter to driver. If you have a little Tiger in training, you may want to start them off with the best… not a cheap set you can pick up a Wally World. You’ll get just that with the Phenom, and it’s a set that will hold its value at the Pro Shop when it’s time to upgrade down the line. We love the fact you can choose an age-range or size, and everything about the Phenom Youth set is of the highest quality from the driver to the bag. One of our top choices for women is another golf set from Callaway that also hails from the Strata lineup. It’s the Strata Complete, which comes with only seven clubs, but still provides a considerable amount of value if you’re just starting out. The Callaway Women’s Strata set is comparable to the men’s version with a few key differences. While they have a similar style and lie for the most part, the lofts, lengths, and swing weights are completely different. You’ll also get a 5-wood instead of a 3-wood with a lightweight shaft and a 5H or hybrid club that will take the place of a few long irons. Both fairway drivers are well-built with large sweet spots, and you can say the same for the regular driver. 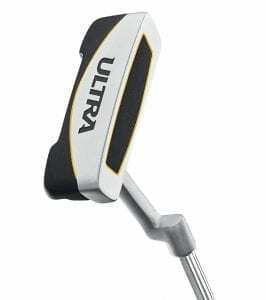 It sports a super lightweight graphite shaft and is 44-inches long with a loft of 16-degrees. It’s a C9 club with a weight of 341 grams and a lie of 58-degrees just like the 5-wood. While we love the hybrid club, you’re going to have to hope it gives you enough distance off the fairway. That’s because there are only two irons in this set with a 7-iron and 9-iron. They will provide you with plenty of range, but you’ll need to upgrade to the Strata Ultimate or Strata Plus if you want more clubs. The latter adds the 6 and 8-irons along with a pitching wedge while the Ultimate set gives you those along with a 4H and 3-wood. All three have slightly different bags as well. The irons and wedges in this set are weighted around the perimeter with progressive sole tech which helps improve your control on the fairways and shots approaching the green. As a bonus, all the shafts are graphite except for the putter which is sports a steel shaft and is in the T-style alignment. It’s a lightweight set that can lengthen your game and perfect for women of average height or those that are a little shorter. If you are closer to 6-feet than 5 ½”, you may want to consider the length carefully. Callaway did an amazing job putting together this set, and while we would have liked to see a few more irons in the bag, their other sets cover that. This one is an excellent option if you’ve never picked up a club before as they won’t break the bank or your back when you’re walking the course. These clubs are available for righties and lefties and come with a 2-year warranty along with a few covers for the driver and hybrid club. The bag has a built-in stand, rain hood, and five pockets to take care of your gear. Golf is one of those rare sports people can play well into their senior years. You can even start late, unlike football, baseball or soccer. If you’re closer to retirement age than your college years, the Wilson Profile XD Senior set should definitely be on your radar. This senior set is built for older golfers between 5’5” and 6’1” whether they are a man or women. They are easy to hit and have a special senior flex graphite shaft. The grips are also larger and easy to grasp which give you more control on the approach or off the tee. The irons have perimeter weighting with stainless steel heads with large sweet spots. 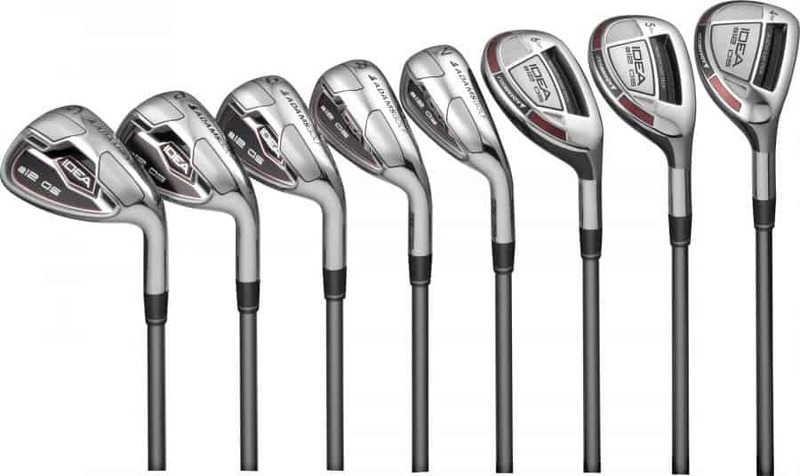 You’ll get four in the set with clubs 6 – 9 and a 5H hybrid club with high launch tech. There are also two wedges – one built for the sand and one for your approach shot. The latter gives you more control of the spin, and the sand wedge has a wide sole with “super” low weighting to help you get out of those traps. The low weighting carries over to the driver as well. It sports a 460cc forged titanium composite head, and as you’d expect, a large sweet spot. You can follow that club with a fairway wood which sports a similar build, but a different length and loft. Last but not least is the putter with heel-toe weighting which is solid, but not on the level of the rest of the clubs in our opinion. 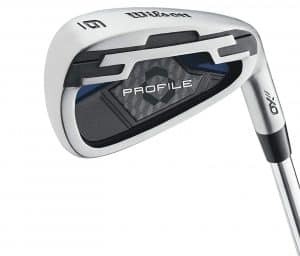 Seniors will appreciate what the Wilson Profile XD golf club set brings to the table along with the fact you won’t have to dip into your retirement fund to afford them. 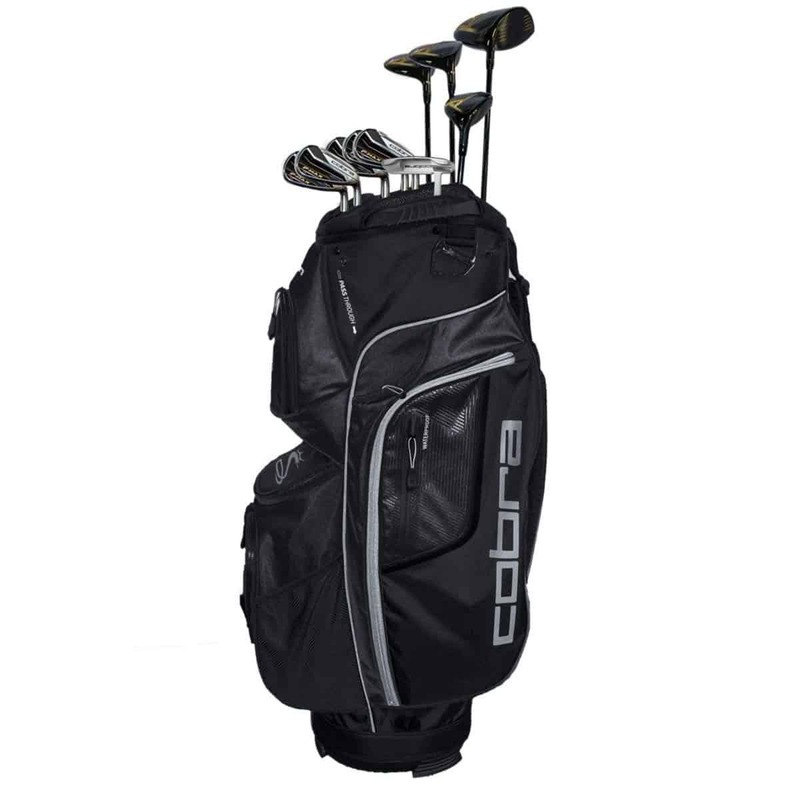 The clubs come with a car bag, three club head covers, and a 1-year warranty. Whereas our top choice is built for beginners that want a solid set of clubs, the F-Max series is for golfers looking to start off with the best. Cobra spared no expense on this set, and while they may give you sticker shock, they will definitely up your game. The F-Max set contains a total of 12 clubs which may be surprising considering the cost. While there are plenty of beginner golf club sets that will provide you with a full 14 for far less coin, they won’t have the same build quality, and fine features Cobra applied to the F-Max series. You’ll want to know these clubs are only for right-handed golfers – Cobra doesn’t make them for lefties. They are also fixed weight with a center of gravity towards the back which may not be for everyone but will help you hit the ball straighter and even makes those bad shots look a bit better. They have a deep undercut as well which gives you more speed, even when you hit the ball off center. The lower irons 4 through 7 feature 17-4 stainless steel to help those long fairway shots gain some length, but the 8-iron, 9-iron, and wedges all use 431 stainless. This gives the clubs more “feel” which in turn gives you more precision on the approach. The wedges in this golf set are just as high-tech as the rest of the clubs and will definitely give you more control around the greens due to their design. They are in the C9 class when it comes to swing weight and feel great in the hand. The putter is only average in our opinion, however, and while it will get the job done, you may want to upgrade. It’s a sturdy blade style putter, but if you want something unique, give the TaylorMade Spider series a look. These clubs look great, and much thought was put into their design. They all have midsize Cobra Max Lamkin Rel grips, and the irons will last for years to come considering they’re nickel chrome plated. Unfortunately, we weren’t able to dig up too many details on the bag. It’s a large cart bag with more pockets than most, but that’s all we know aside from the fact it isn’t leather. 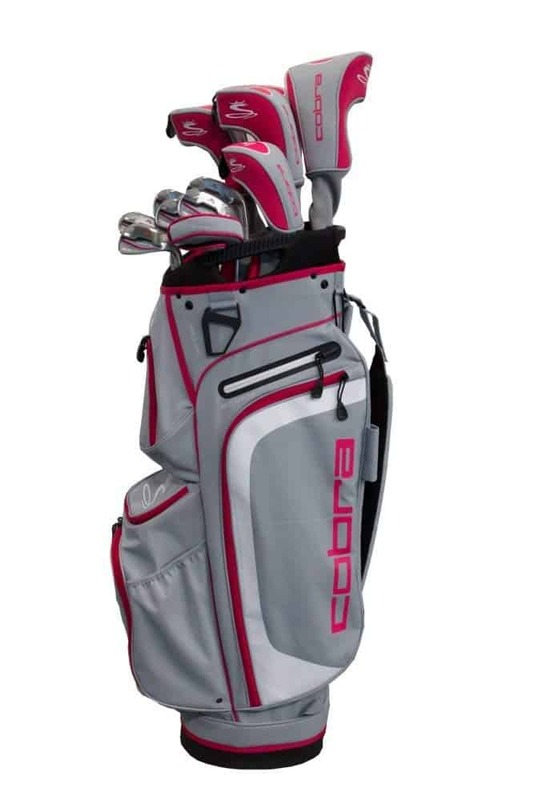 The Cobra F-Max club set comes in two configurations with a regular set and one geared towards seniors. Both have lightweight graphite shafts, but the senior set’s driver has a loft of 11.5-degrees and a D0 weight while the regular drivers is 10.5-degrees and in the D1 category. These clubs come with a 2-year warranty, head covers, and are available for ladies as well but only if you’re right-handed. Wilson may not be the first name to come to mind for new golfers, but it’s a brand we highly recommend. They have put millions of clubs into beginner’s hands over the years, and the Wilson Ultra Complete set is your best bet if your budget is tight. While Wilson bills this set as “complete” you’ll actually only get nine clubs. That’s enough to get anyone started, but you will be limited in a few areas like sand traps and potentially the fairway. It all depends on the distance you can get although we don’t think you’ll have any problems with the woods. When you’re ready to tee off, a 460cc titanium matrix driver is at your disposal. It has a large sweet spot to help increase your accuracy and a loft of 10.5-degrees. Details are a bit sparse on the fairway driver and hybrid club which is unmarked but believed to be a 4H. We don’t have any other tech specs to share, and the same goes for the irons unfortunately. The irons are what we would refer to as “solid” but not as forgiving as a club from Callaway or other top-tier brands. They also leave a considerable gap in your arsenal as you’re only getting irons 6 through 9 along with the mysterious hybrid. As mentioned, there is no sand wedge, but you will get a pitching wedge and a heel-toe putter with a paddle grip. Included with this set is a standard, but sturdy carry bag with a shoulder strap and stand. You’ll also receive head covers for the drivers and can choose between Red and Yellow color schemes. Lefties will be thrilled with this set as well and won’t feel left out. 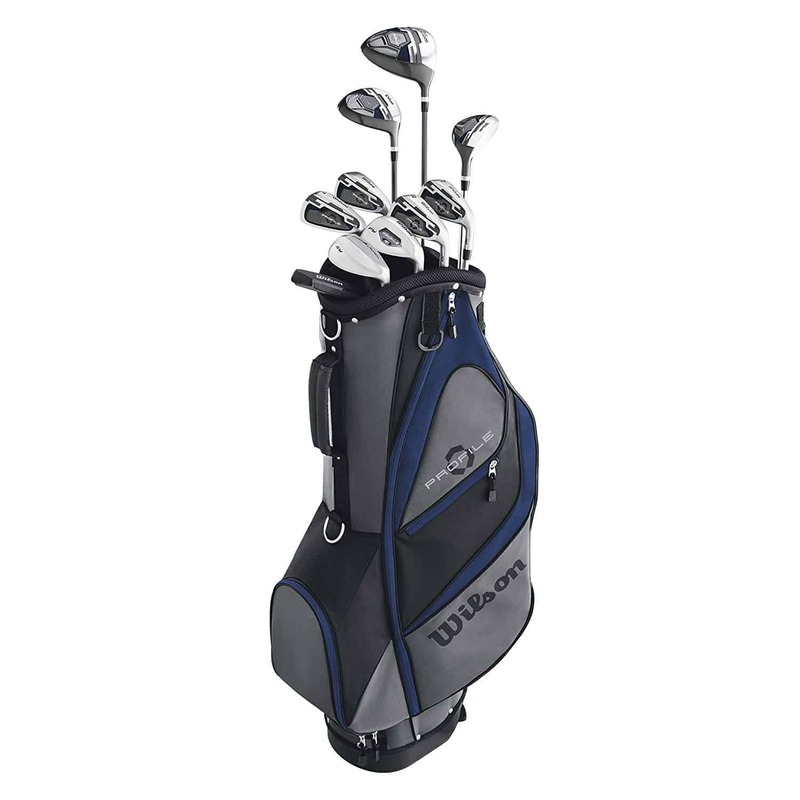 The Wilson Ultra Golf Club set comes with a 1-year warranty out of the box. When Callaway clubs are just out of reach and Cobra or Pings aren’t even a consideration, sometimes it’s time to turn to lesser-known brands. 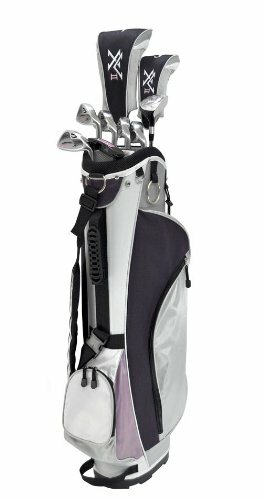 The Knight 12 piece complete golf set for women is a slick starter set that’s well built and affordable enough for folks just starting out. Knight decided to keep the irons to a minimum in this set, so you’ll get the 6-iron through the 9-iron along with a pitching wedge. The irons are sturdy with steel shafts and are cavity backed with perimeter weighting. While we don’t have the measurements, the company says they are oversized. Either way, you slice it… the clubs look good and will hold up well as long as you don’t get wild on the course. In the woods department, there are three clubs with the driver, a 3-wood, and an unusual hybrid club. 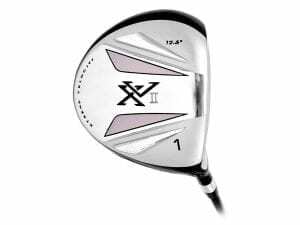 The driver has a 12.5-degree loft to go along with a lightweight, flexible shaft while the 3-wood has a 15-degree loft and a steel shaft. We believe the driver is around 44-inches long but are in the dark when it comes to the fairway wood and the funky hybrid. Why is the hybrid club unusual? Normally, a hybrid club is meant as a substitute for one of the lower irons in your bag, and they have a number like 4H which lets you know which club it replaces. The hybrid in this set is labeled as a “4/5” which means it’s meant to replace not one, but two clubs in your bag. It has a loft of 23-degrees, but that’s all we know about this particular club for sure. The pitching wedge and putter are both pretty standard, and won’t win any awards for performance or design. Both have steel shafts like the irons, and the putter is in the blade style with perimeter weighting and a precision face. If you prefer a mallet putter, the Pinemeadow PGX would be a great option and has a price in line with the rest of the set. There aren’t any real extras to note with this set aside from two head covers for the driver and fairway wood. The bag is in the cart class with shoulder straps but sans legs or a kickstand. It does have an umbrella holder, however, and a 6-way graphite safe compartment top. Details may be a bit vague for the Knight Women’s Complete Golf Set, but it’s a set consumer’s love, and we can see why. The price point makes it perfect for beginners, and it comes with a 1-year warranty to boot. While we would have like to have had more than 9-clubs in the bag, it’s enough to get you going if you dig the hybrid 4/5. Whether your little golfer is 3-years old or just hit their teens, Tour Edge has just the thing for you. The HT Max-J Junior golf set is available in a wide variety of options and is one of the more affordable alternatives as well. If you’re not sure how your child will take to golf… this is the one you want. Tour Edge put together a great set of clubs that come in three sizes for three different age ranges. All use the same type of technology; the lengths are just different. This means you’re 5-year old can use a mini Max-J driver just like their older sibling, and sets can be passed down – a definite bonus if you have a large family. All the shafts are graphite with a low kick-point while the fairway woods, oversized irons, and hybrid clubs are made from good old stainless steel. The fairway wood has a radiused sole while the hybrid clubs have a deep center of gravity. Despite their size and price, they are very accurate clubs with some practice. The woods use titanium in the head and the driver clocks in at 350cc. We love that the Tour Edge HT Max-J set comes with a mallet putter as well, and the ability to purchase each club individually if you ever need a replacement. You’ll be thrilled to know these clubs come with a lifetime warranty. While we didn’t pour over the fine details, it’s safe to say you’ll void it if your children decide to act out Star Wars with their putters. Regardless, it’s rare to find clubs with over a 2-year warranty, especially in the “youth” category. The clubs included depend on the set, and we’re going to keep things fairly simple. The Small set is rated for children 3-5 and comes with three clubs including a fairway driver, 7-iron, and putter. The 5 to 7-year-old set replaces the fairway driver with a hybrid and adds a real driver to boot. You’ll also get a 7-iron to go along with the 9-iron and putter. Older children will receive all the aforementioned clubs and a sand wedge. 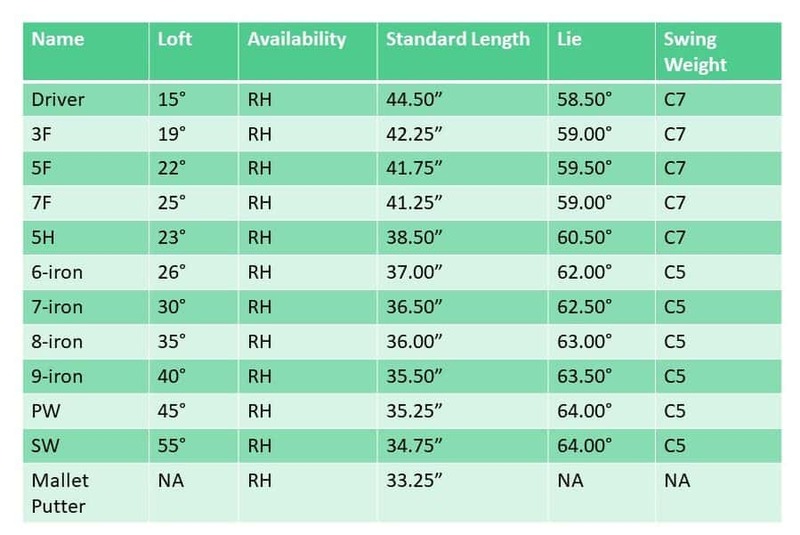 It’s obvious the company paid attention to the details across the HT Max-J range as you can see from the specifications chart below. This set is available in red and made for both left and right-handed golfers looking to learn the game. There is also a pink set available, but the options are limited with only two sets for the 3-5 and 5-8 age ranges. Lefties are out as well with the pink set although girls and boys can use either due to the varying lengths. We hope you liked our options as we tried to choose the best golf clubs beginners would enjoy, not just affordable sets. Golf is a lot of fun, but only if you have the right equipment as nothing will ruin your day faster than seeing your club head fly across the course. In which case, just call it a day and head home to one of these bad boys. Or maybe take up billiards instead. Until you’ve used one of their top-tier clubs, it’s hard to understand what they can do, but trust us when we say they are ranked among the best each year for a good reason. Our top option for the money also comes from Callaway. We chose this Strata set due to the fantastic price point and the ability to drop down from a 12 to a 9 club set. It’s a great looking set that won’t let you down on the course and will last for years to come. Whether you have dreams of being the next Ricky Fowler or just want to play a few rounds with your friends, we tried to include a set of clubs for everyone. If you feel we missed an important topic in our beginner's guide or you’re wondering why Ping isn’t on the list, let us know in the comments section below! How long does it take to play a full round of 18 holes? That depends on your skill level, the people in your party and the golfers in front of you. On average, you’re looking at around 4 ½ hours, but it can be considerably longer depending on the groupings and the course itself. Can I get exercise playing golf? While you will build up some new muscles over time from swinging, you’re only going to burn calories if you walk… not ride the cart. With that in mind, walking 18 with clubs on your back or in a pull cart is not easy if you’re out of shape, so don’t overdo it. Golf is supposed to be fun, not a full body workout. Which tee box should I use? You’ll notice at least three places to tee off on most holes, and the classic color combo is blue for the back, white for the middle and red in the front. The back tees are known as “Pro” tees; the white ones are for men and the red for women. While you can tee off from any box you’d like, they are there for a reason. The color combinations and number of tee boxes may vary from course to course as well.